Housing and Redevelopment Officials (NAHRO). The contest was intended to draw attention to the national need for affordable housing, giving young artists who live in those facilities the opportunity to express what home meant to them. 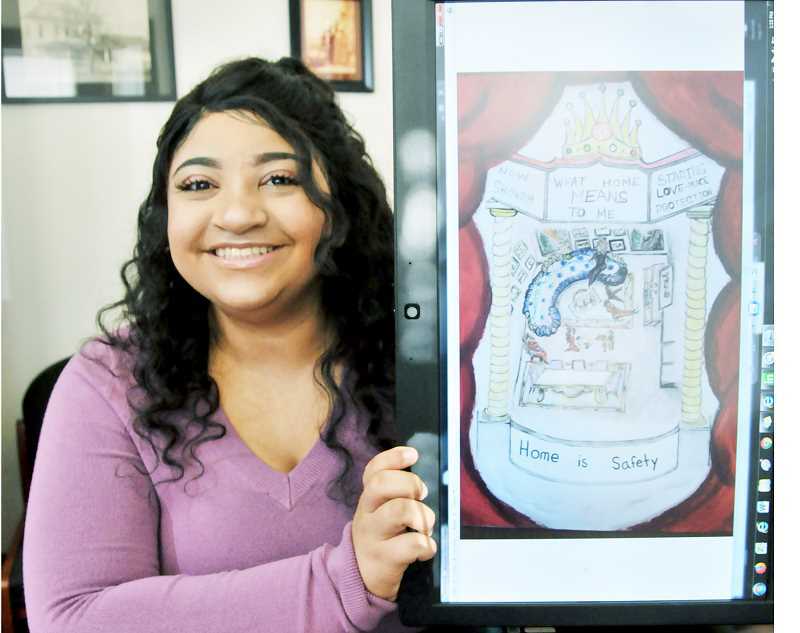 Hendrix, a senior at Newberg Catalyst High School, painted a depiction of her family's apartment. "When I did it I was thinking of the story of my life," Hendrix said. "This is actually what my apartment looks like. My mom does art and so do my brother and I, so we're wall-to-wall with paintings in our place." Hendrix was born in Portland and her family moved multiple times over the past 18 years, relocating from Portland to Las Vegas to Beaverton and Newberg. She and her family have called Newberg home for the past three years. Wherever they lived, Hendrix said home was always around her siblings, who she painted in her submission. Her passion for art was not directly influenced by her artist mother or art-inclined siblings, but it was a product of needing to fill time whenever she was grounded or sent to her room as a young kid. Painting came to her naturally during those times, she said. "I care about my siblings so much, that being around them is home," Hendrix said. "Painting this was a bit of a struggle, but I was able to express that." Deskins Commons resident manager Teresa Velazquez had been trying to get Hendrix and her siblings to participate in the contest for multiple years. When she finally convinced Hendrix to attend a workshop and put together her piece, it paid dividends. Hendrix said she is glad Velazquez convinced her to participate. "Teresa wanted my siblings and I to participate for the last three years, but I never did it until this year," she said. "I always have a lot of schoolwork to do, so it was hard to balance." Hendrix painted her winning piece with acrylics and enjoys painting in her free time, but she doesn't envision a career as a painter. She said the job of makeup artist is intriguing at this point, and she aims to use her skills to potentially advance in that field after graduation. "It's like art on people's faces," she said.